There’s nothing more frustrating for students than wasting precious time setting up hardware and software when they should really be spending most of their lab time focused on high-level learning. 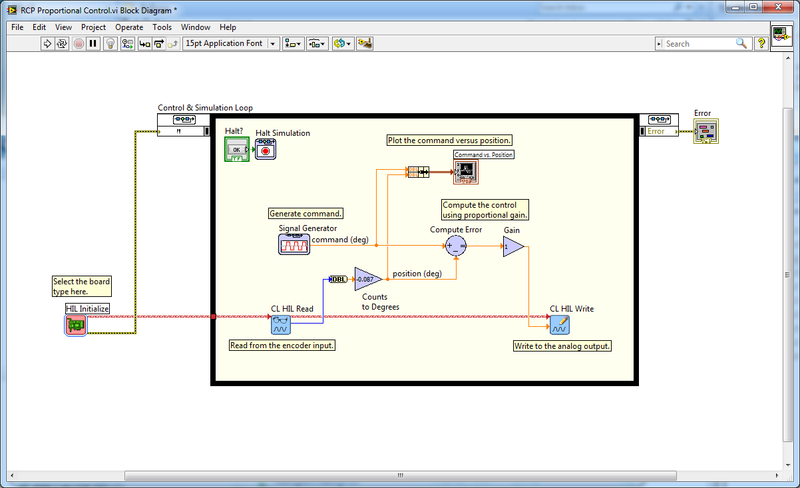 To help anyone working in the National Instruments (NI) LabVIEW™ graphical development environment to avoid that problem, we created the Quanser Rapid Control Prototyping (RCP) Toolkit. The RCP Toolkit is a key element in Quanser's NI-based turn-key platform for controls education. When combined with NI's Control Design and Simulation and Mathscript modules, it allows your students to accomplish everything from simulation to implementation. The RCP Toolkit is one of five key elements in our NI-based turn-key platform for controls education. When it is combined with NI’s Control Design and Simulation and Mathscript modules, it becomes a true Rapid Control Prototyping environment, a design tool that allows your students to accomplish everything from simulation to implementation. Essentially, the RCP Toolkit is a set of three preconfigured HIL interface VIs - Initialize, Read, Write - that simplify and therefore speed up many common controls, robotics and mechatronics programming tasks. The Quanser RCP Toolkit is a set of VI's that significantly speed up programming tasks and allow students to concentrate on high-level learning. Using the Toolkit, cRIO and Windows-based controllers can be targeted using a single VI, and targets can be switched through a single menu. In addition, all outputs are safely zeroed when the controller is stopped appropriately or aborted unexpectedly. 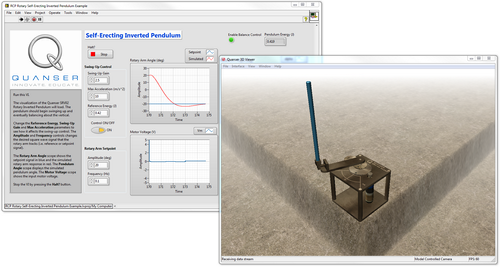 A three-dimensional visualization of Quanser’s rotary inverted pendulum control experiment is included to help students bridge the gap between the theory and practical implementation of the topics you are teaching. To help students bridge the gap between theory and practical implementation, a three-dimensional visualization of Quanser's rotary inverted pendulum experiment is included. Adding to the speed and simplicity is the availability of Stream VI’s that add a set of protocol-independent communication VI’s in which communications are abstracted to two basic VI’s – Stream Server and Stream Client. Students can then switch easily between a number of protocols such as TCP/IP, shared memory or RS232 using the same application. Last but not least, the RCP Toolkit supports over 50 data acquisition boards from both National Instruments and Quanser. If your teaching or research lab incorporates the NI LabVIEW™ graphical development environment, adding the Quanser RCP Toolkit allows you to significantly enhance its simplicity and effectiveness for everyone who uses it. For software specifications and related information about the Quanser RCP Toolkit for NI LabVIEW™, click here. For a demonstration, contact us at info@quanser.com.